In this 15-minute podcast we learn about filmmaking from three local filmmakers — the 2016 Celluloid Bainbridge Film Festival Director Matt Longmire, and long-established professional filmmakers Katie Jennings and Courtney Jones. This 18th annual Celluloid Bainbridge festival is occurring on Saturday and Sunday, November 5th and 6th. Daytime Saturday is for free filmmaking workshops open to the public at Rolling Bay Hall. That evening, tickets are available for an Opening Night Party at The Marketplace at Pleasant Beach, followed by special featured screenings. All day Sunday, from 10am to 9pm, tickets are available for you to enjoy several categories of shorts and feature-length films. 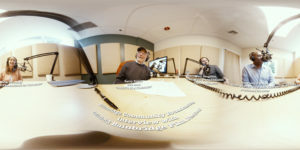 Fish-eye 360-view of podcast in progress (L to R): Katie Jennings, Barry Peters, Matt Longmire, Courtney Jones. Photo credit: Courtney Jones and Samsung Gear 360. Click to enlarge. In this BCB conversation, professional filmmaker Courtney Jones describes how he recently filmed his feature-length drama almost entirely on Bainbridge with an experimental mix of cinema camera and mobile phone cameras. It’s called “Wood Witch: The Awakening”, and it’s enjoying its premier at the festival. And BCB’s host Barry Peters briefly mentions BCB’s community video podcast about “Owen’s Playground” that will be shown at the Festival with other short docs on Sunday the 6th at 12:30pm. For further information and discount-priced tickets in advance, go to the Celluloid Bainbridge website. The festival is sponsored by Arts and Humanities Bainbridge.